Welcome to a brand new blog post! Trinity Leeds invited me a while ago, to celebrate their 5th Birthday and I thought that I would talk to you all about it. I thought that, in today's post, I would take a different spin on it and, talk about the memories that I have of Trinity Leeds. 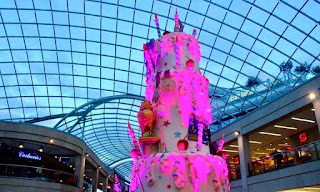 Trinity Leeds invited me to see the release of the massive cake that would be honouring the birthday, a day before the general public coukd. The Cake was literally bigger, and, more beautiful than I could ever be. Pink in colour and decorated with things that scream Leeds such as Northern Ballet and much more,. The Cake itself was a Red Velvet, which I love but I rarely have due to it being lactose on lactose with an amazing colour. It was an amazing cake and I loved talking to everyone including some amazing Leeds bloggers such as Lizi, Lucy and Lucinda,. Don't forget to check them out! I remember when Trinity Leeds first opened, everyone knew that Trintiy Leeds was here and that it was going to impact the shopping experience of West Yorkshire, by a long shot. I remember how most of my friends were interested in the dynamic One Direction merchandise based store that was a part of the centre at the time. I remember the buzz of the first week, with oohs and ahh's from members of public, when they looked up at the grand roof of this magnificent shopping centre. One of the other times that stand out to me, is, when I went to my first Student Lock In. I dragged a group of friends and we ended up exploring the crevices of the shops that lie within the centre. The glorious thing about Student Lock In, is that there are discounts and goodies every corner that you turn. I think a few of the main reasons that this resonates as an amazing memory for me is, that, I got to see a student community awaiting to have a good time within somewhere that isn't completely alcohol fuelled, which is rare, and, because this was the night that myself and Michelle became lifelong friends, Myself and my friends have all matured in different ways but I will always hold this memory and the group of friends close to my heart. I've also met well known bands including, Neck Deep, due to the amazing store that used to be in Trinity Leeds, which is known as Pulp. Pulp was and stil is, the epitome of what I like my aesthetic when it comes to fashion to be like sometimes. I remember meeting my friends, making my way towards the store and queuing in line to talk to the guys that made up the band. I had to rush afterwards as I was meeting Michelle, and, a few other friends for a night at Wetherspoons which I remember quite well. I have other memories of Trinity Leeds including the amazing food that I have tried at the shopping centre, and, the fashion finds that are still within my wardrobe, and, I hope to enjoy more food, find more amazing clothes and have more great memories in Trinity Leeds very soon. 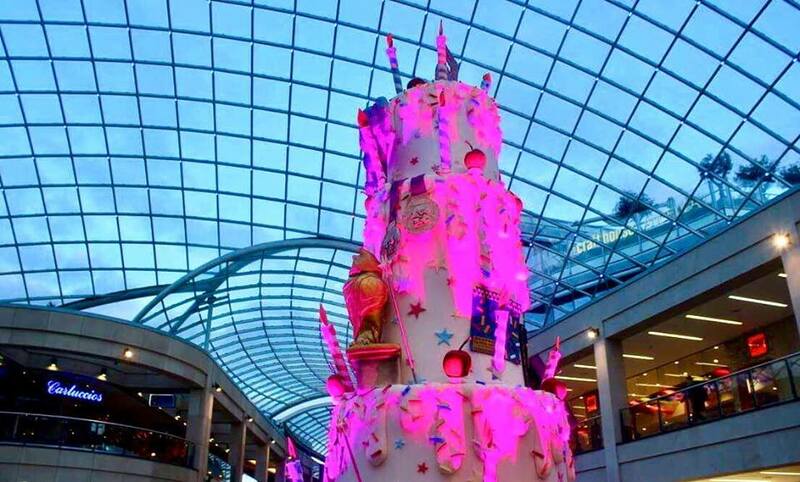 Have you had any good memories at Trinity Leeds? Let me know down below and if you've had any good cake then let me know! I hope that you've enjoyed this slightly food based blog post and I hope that you come back soon to read the next post!